I initially created this campaign to offset the cost of my taking a short unpaid leave of absence -- from my job at Amazon -- to support and aid however I could my fiancé LB in her fight against metastatic breast cancer, a fight that has been going on since she was diagnosed in 2015. PHASE 1 of this campaign enabled me to travel to North Carolina to be with her during October 2018. LB handles her situation with a fierce optimism and this is expressed and exemplified by her preparing an unconventional cancer testimonial. For her cancer testimonial she's fashioned one of musical delivery. She's taking what is a very emotional, powerful experience and -- through collaboration with a local musician, Mr. Byron Pink and myself -- is making it happen. 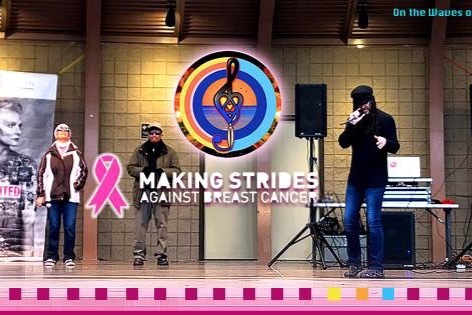 The ball really started rolling in May of 2018 and most recently we presented 3 songs at the inaugural Making Strides Cancer Walk at the Town Commons in Greenville North Carolina, pictured below. PHASE 2 of the On the Waves of Hope Campaign is directed at offsetting the costs of this musical production. Her 11 song musical piece we see to be her legacy in regard to cancer, communicating a more complex experience through its use of the musical format. It takes what can be a sad, even grim subject and transforms it ultimately into a message of hope, optimism and resolve. Here is an example drawn from her music testimony which she has titled "On the Waves of Hope". I happened to write this song from the point of view of the Caregiver. This is a video I made where I detail a bit about the process of writing the song as well as perform it. Today is 11/12/18 and I have just begun to transform this campaign into PHASE 2. More videos and information shall be provided. Thank you so very very much for taking the time to consider aiding my campaign and our cause. The On the Waves of Hope campaign has moved into Phase 2. Thank you to all who supported me in Phase 1. More updates will be posted as what we call Phase 2 is fully implemented. Thank you! This last week was one packed with the mix of medical visits, life and creativity. LB has her appointments and treatments during the week which I accompanied her to. A range of meals were made, much of which was shared communally. 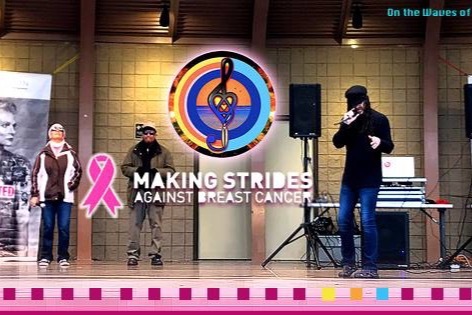 I worked on a additionally musical piece and -- pictured was Saturday morning, when we attended and I performed 3 songs from "On the Waves of Hope ©" for Greenville's first ever #makingstrides walk, held at the Greenville Town Commons. This campaign I will tell you has allowed me to be *present* for LB, with my attentions devoted to our experiences here, day to day, unconsumed by disproportionate worry. You know a lot of the concentration has been on LB -- as it should -- born of my concern for her well-being and peace of mind, but as I have been here and we have simply spent time together I feel a kind of oh-so-welcomed deceleration. I know this acclimation is quite temporary. I arrived on Friday 10/19. Over the weekend we've been working on a musical project together with Byron Pink, I experience a quietude I have not had in a while. This peace allows me for once to try, to relax. All of the medical activity is during the week, so time has been relaxed and easily paced. Something I have not had for any amount of time in years. In my neck of the woods, work or home, it happens to be frenetic with noise, louder and arrhythmic most times -- a constant presence lately. You shut it out but cannot shut it off. There are so many levels of benefit and my appreciation cannot be understated. As we approach the week, I will provide more updates. Thank you again and again to everyone involved. I prepare everything to head down South tomorrow, I will be posting updates to my Twitter and Facebook. Today I refine the campaign site and other elements of this effort.